The state of gender at the Conference of Parties(COP) is largely unchanged since I have been attending for the last 3 years since COP18 in Doha, Qatar. As countries are called upon to raise ambitions regarding emissions targets, Gender Day stands as a reminder that ambition must encompass more cross-cutting issues. Gender Day emerged at COP18 in Doha, Qatar and has since become an annual event. The day is filled with gender-themed side-events and high level sessions that serve as a vehicle for advancing conversations of gender equality within the United Nations Framework Convention on Climate Change (UNFCCC). Mary Robinson addresses the room at the high-level dialogue on Gender. The day started with the dedication of a tree planted in memory of Nobel Peace Prize winner, feminist, environmentalist, and human rights advocate Wangari Maathai. 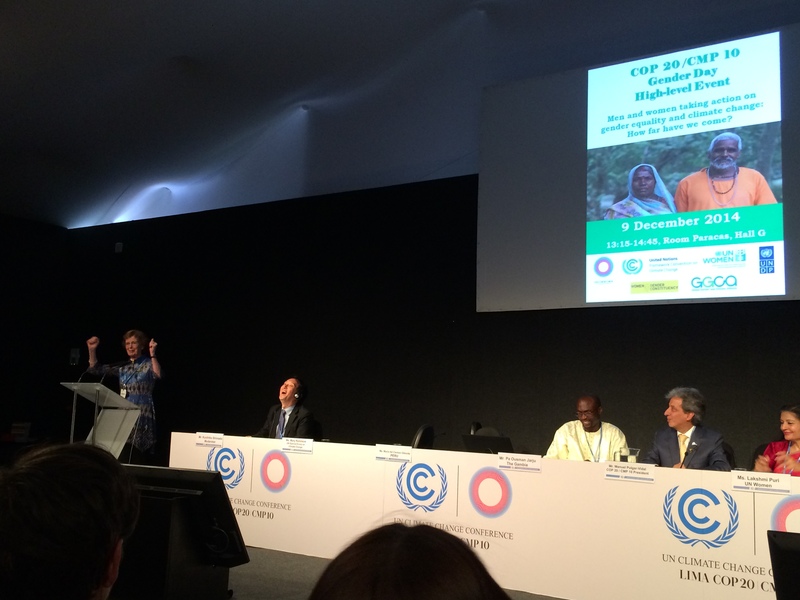 Gender Day at COP20 took a different tone than those of the past two years with Mary Robinson, UN Special Envoy for Climate Change, setting the mood at the high level panel for gender. Robinson acknowledged that gender equality has come a long way since the Beijing Declaration was adopted in 1995, but that there is still a long way to go. Robinson stated, “We need to continue to strengthen women’s rights and not let them backslide.” These remarks shortly followed the SBI decision on gender which was finalized on Friday, December 5th. The text denied the use of “gender equality” and instead utilizes the less impactful term “gender balance”. This means that low ambition for equitable gender participation will remain the norm within the UNFCCC in Lima and beyond. In the past two years, Gender Day has served as a platform for discussing women’s vulnerability to climate change without necessarily talking about how women contribute on an international scale. Although women are on the frontline of the impacts of climate change, there are not appropriate avenues for them to share their experiences and knowledge within the UNFCCC. Because of this, the side events and panels on Gender Day tend to be one of the few venues where women’s positive contributions can be heard within the conference. 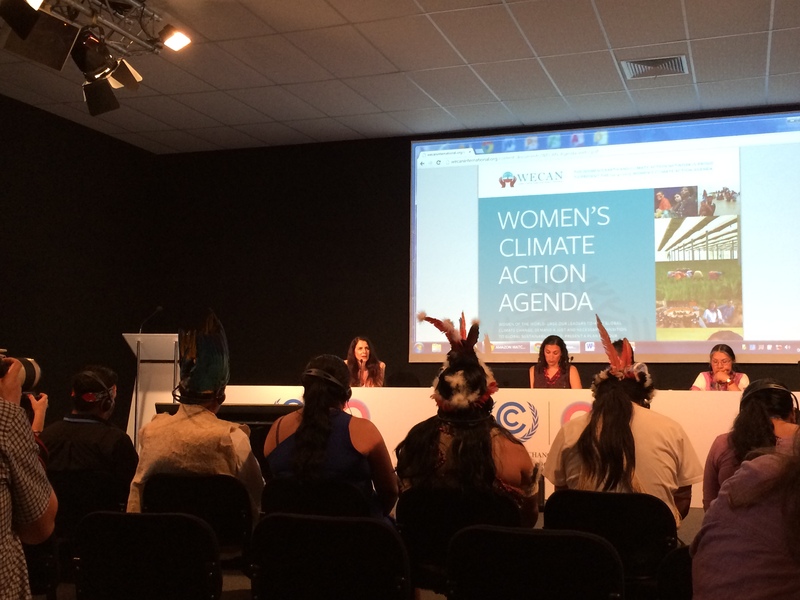 We need to re-center dialogue away from women as victims of climate change, but as key change and decision-makers. Side Event Panel discusses the impacts of energy extraction on communities in Georgia and the Amazon. In order for Gender Day to fulfill its intended impact, the UNFCCC must fully recognize that gender equality is a human rights issue and address the institutional barriers that block progress. Gender Day must not only be about women, but should address the needs of all genders through gender responsive texts in the negotiations.